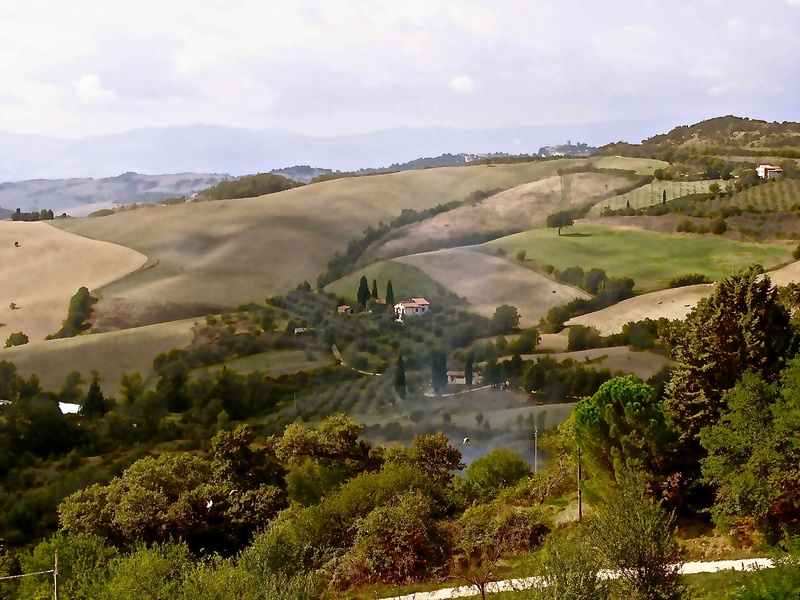 Today head south through the beautiful Tuscan hillside to the village of San Casiano dei Bagni. The village was discovered by the Etruscans and known for the abundant (42) thermal springs which were later developed by the Romans. There are still 5 star spas to be found here! San Casciano dei Bagni, a hill town overlooking the Val di Paglia, springs from a thick woods of oaks, chestnuts and ancient pines. The medieval village reveals a labyrinth of narrow roads winding around a church. Today the main entrance from the south, the “Porta,” leads to the Piazza Matteotti, where there are spectacular views of the valley below. There is also Ristorante Daniela, located right on the piazza. I was drawn to the charming cave-like ambience. Greeted by Daniela herself, we were delighted with the specialties of the house. Our meal of Tuscan ham, cheeses, homemade soup and pasta, was washed down with good local wine. Enjoy a day in San Casiano dei Bagni! Ristorante Daniela is located at 6 Piazza Matteotti, San Casciano dei Bagni, Italy.